Last Friday afternoon I was in the garage fixing bike tires when the UPS truck rolled into the driveway and the drive handed me a large package from ECHO Fly Fishing with all sorts of good stuff inside. Tim Rajeff is always super kind in making sure that I have all the latest and greatest fiberglass fly rods from their shop and with the recent release of the River Glass series, it'll be stellar to give them all a flex in the coming weeks. When Tim Rajeff went back to the drawing board to conceptualize the River Glass series, he worked through their previous light line weight fiberglass offerings (which were split between two series) and picked out sweet spots in each line weight to then determine the best rod lengths. Add to the mix new S2 fibers in the construction and in the end, six models, covering two weight to five weight and lengths from 6'9" to 8'6", made the cut. The entire series is offered in colors Amber and Glacier and fly rods include a matching fiberglass rod tube. These fly rods will be really easy to travel with as the short two and three weight are three pieces and the rest of the line up are in four pieces. 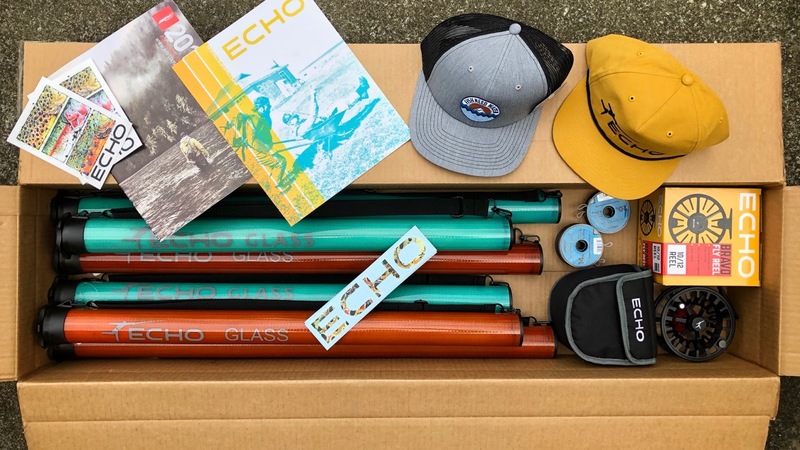 The River Glass line up is priced at $249.99 and come with the ECHO Lifetime Warranty. Looking for a new two through five weight, consider the ECHO River Glass.